Want to enrol inter-school chess championship in 2018-2019? Applications now open! The Tokyo Bilingual Chess Club is to bring chess into the classrooms of as many schools in Tokyo as possible, with the aim of establishing a thriving chess culture in the community at large. 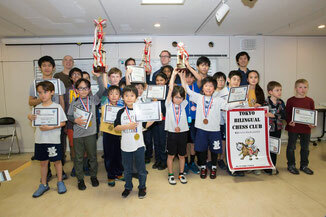 Interschool Chess is one of the ways in which Tokyo Bilingual Chess Club is working to achieve this by bringing schools in the community together regularly for events and competitions. Details on our Inter-school Chess Championship can be found below. Date: 18th of May, 2019 (Sat) DATE CHANGED!!! Entry Fee: 32,000 yen/team (34,560 yen tax-inclusive) No refunds will be given after April 30, 2019. Awards: The winners get trophies and special prizes and the 4-6 places get chess gifts. Chess Notation: Strongly encouraged for those students 3rd grade and older. Bring: Pencils, notepad, tournament chess sets, and chess clocks if you have them. If your school would like to enrol in the 2018-2019 inter-school chess chapionship, please contact us to contact.us@beaconsq.info as soon as possible. Generally events are held in the second half of each school year, schools need only provide a list of players and entry fees two weeks in advance.